New Images of Hasbro’s Single Carded 3 3/4″ G.I. 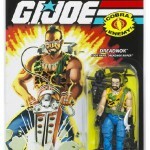 Joe 25th Body Style Modern Era Wave 12 Action Figures have been posted. Tripwire comes with the Meteorite Element and the Cobra Diver comes with the Heavy Water Element. These 2 element containers will complete the Build-A-M.A.S.S. Device located in 5 DVD entertainment battle packs.